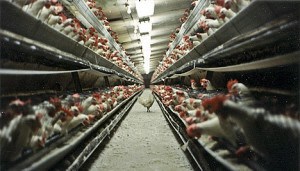 Court Dismisses Legal Challenge to the Animal Enterprise Terrorism Act. Here’s How That Affects You. Five longtime animal rights activists filed the lawsuit against the Animal Enterprise Terrorism Act, which is a law passed in 2006 at the request of groups like the National Cattlemen’s Beef Association, Pfizer, and GlaxoSmithKline. The activists cited vague and overly broad language throughout the law wrapping up protest activity that causes a “loss of profits,” along with its attempted use against activists for protesting and chanting. All of this, combined with the “eco-terrorist” public relations campaigns of industry groups and the harassment of law enforcement, has had a chilling effect on animal rights activists. This was the foundation of the lawsuit brought by the Center for Constitutional Rights: the AETA has not been used against the plaintiffs, but it has made them afraid to speak up. In other words, the Justice Department and District Court are both making clear that the AETA can’t be used against the types of activism listed above. The government is publicly limiting its official interpretation of the law, and rebuking what some industry groups and lobbyists have sought. That’s good news. Those statements about the law’s scope are positive developments, but they are not binding in any way. They are ammunition to be used in the defense of activists in court, and they may even be a deterrent to prosecutors and industry, but they’re not safeguards. More troubling, though, is that Judge Tauro’s ruling completely sidesteps the core First Amendment arguments at issue in this case by noting that these activists aren’t breaking the law. It relies on the idea of “lawful” conduct as a crutch: if activists are behaving lawfully, the reasoning goes, they have no reason to fear prosecution, and thus no right to challenge the law in court. The statement above is a victory in that it limits the scope of the law, but it does not go nearly far enough. For example, note that “trespass” is included alongside “violent actions.” As I argued in my Congressional testimony — and as supporters of the law conceded — this could be used against activists who non-violently break the law through civil disobedience. And as FBI documents revealed, the bureau has considered prosecuting undercover investigators as “terrorists” because they “trespassed” and caused a loss of profits. In addition, “theft” would include activists who rescue animals from horrific cruelty and neglect. Removing a suffering animal from a factory farm without permission may not be legal, but it is certainly should not be the purvue of terrorism legislation. On top of all this is a much bigger concern. Across the country, states are considering “ag-gag” bills that criminalize undercover investigators, whistleblowers, and even journalists. Those bills became law in three states last year. Some of the bills this year are so broad that they criminalize anyone who takes photographs or video of factory farms, or who “possesses” or “distributes” that footage. The court’s promises about “lawful” activity not being at risk are meaningless as corporations are seeking to radically redefine the law. Given the concerns I raised above, and given the “ag-gag” bills pending across the country, it may come as a surprise that I think this lawsuit has been a victory. The ruling itself will be appealed, according to activists and the Center for Constitutional Rights. That legal fight continues. This dismissal is a setback, but it is not an unexpected one. Meanwhile, some of the worst-case scenarios envisioned by some attorneys and activists have been dispelled by the government on the record. If activists do find themselves in court, this will be invaluable. Most importantly, this lawsuit reflects a sea-change within the animal rights movement. For years, some animal activists have behaved as if ignoring these ongoing corporate and government attacks would make them go away. Macho posturing and short-sightedness created a climate in which merely acknowledging the growing repression was a sign of weakness; the response to fear was simply to pretend that fear does not exist. By coming forward and shining a light on this legislation in court, activists are confronting their fear, and their opposition, head-on.